Preparing for a successful job search is easier when you start with these 3 questions. You can clarify your purpose, increase your motivation, gain control of your career, and get faster and better results in your job search. These questions can also help you discover your resources and options, take active control of your life, and stop repeating mistakes to get MORE out of your career. Although it might sound overly simplistic, it really is necessary to make sure you can answer, at least to yourself, why you’re searching for a new job. Looking for a new job isn’t an effortless endeavor, and any project without a purpose isn’t likely to be completed. When hitting a rough patch, it’s common for anyone to ask themselves—“Why AM I doing this, anyway?” If there isn’t a good answer, it’s hard to remain motivated! It is also important to consider the fact that “Why did you apply for this job?” is a common job interview question—precisely because it reveals an applicant’s preparedness and level of motivation. If you’re not employed, the answer is obvious. But if you’re currently employed, asking yourself why you’re looking for a new job—- can help you avoid running into the same situation you’re trying to escape. It’s quite common for jobseekers to try to leave a bad situation, only to find it follows them to each new job, which can feel like you’re walking around with a “kick me” sign on your back. A “dead end” is a common reason to pursue new opportunities. It’s important to look at why you’ve reached a dead end, so that you can avoid this problem at your next job. Demand and regulations can change any industry or company, but there are often warning signs. Has demand decreased for your industry? Are new regulations/new trends hurting the industry? Why is company not growing? Are the companies you’re interested in growing? Are you not qualified for a promotion? Do you/Did you not have a career goal? Conflict with a boss or co-worker can make escape seem like the simplest option. But don’t forget—you could get stuck with someone who is just as bad, or even worse at your new position. This is one of many reasons why attempting to repair your current situation could be a better long-term option. Leaving your current position could include the loss of seniority and benefits. If you find yourself in a similar situation at the next position, you will have endured a loss, only to experience what you once tried to escape. Not only can handling interpersonal conflict help you avoid unnecessary loss, the ability to handle interpersonal conflict is a useful job skill. Learning how to handle difficult situations effectively can end conflict, and it can even change the way your boss or other decision-makers perceive you and your contributions. Effective handling of these difficult issues can also result in a raise or promotion. Personal relationships (such as family, friends, and romantic relationships) can benefit from the maturity of being able to handle conflict. Are you absolutely certain you will not run into a similar conflict in the future? Can you set boundaries and manage time to avoid burnout at a new employer? Is burnout common at the new company? Will you fit in better at a different company? What do you not like about your current employer’s culture? Have you attempted to adapt to the work environment? If it is a toxic environment, have you contacted Human Resources about your concerns? An important part of asking “Why?” includes looking at why you haven’t made this change before. If you’ve taken a long time to make this change, why didn’t you do it before? What changed? Did circumstances change? Or did you change? You need to know your “deal-breaker” amount, especially for a transition. You need to know what your skills/experience are worth—for target position, and for location. What benefits matter most to you? Consider total compensation value. This means a new position might come with slightly lower pay, but it comes with better benefits, which can be worth more than your previous salary! Sometimes, a transition to a new career can mean that you’re starting at a slightly lower level of pay if you have fewer skills that correspond to the level of pay you received in your previous line of work. In other words, your new position isn’t likely to pay far beyond the standard salary range for that position in relation to your skills/experience that relate specifically to that position. Even if a jobseeker logically understands that, it can still initially provoke negative feelings to see a smaller paycheck. The later, long-term gain can feel rather distant at first. This is why it’s important to consider your worth in the context of a new position before making a major life change. The long-term gains are worth it, and the desire to continue to build new skills in the new career can help to build and maintain motivation. This shock, however, does not always translate to increased motivation. This is why employers are concerned that if they hire someone who made more money in a previous position, they’re likely to leave if they can’t get a similar or higher rate of pay. The chart on the left is an example of staying in the same position (no promotion) and only modest cost-of-living increases. On the right, a slight dip in pay in year 2 of a career change pays off! As you can see from the charts above, the chart on the left shows what you might expect to earn if you stay in the same position for the next 10 years. The chart on the right shows what appears to be a sacrifice. But it is actually an investment–in a future with better opportunities for advancement. Knowing your deal-breaker amount can help you plan a new career path with an acceptable rate of pay while you’re developing skills that will eventually be worth a higher rate of pay. #3 How BADLY do I want it? Finding and qualifying for your ideal position will take some effort, and maintaining motivation can be difficult. If you have a realistic idea of the challenges you’ll face, it can help you handle obstacles without losing motivation. Starting, and then stopping a job search can be discouraging, and it can be difficult to start again. It is common for jobseekers to give up if a poorly-planned attempt at a job change or career change does not bring results as soon as expected. Continue to work in a job that isn’t fulfilling. Continue the search for a new job or career, even after spending a lot of time—without results, or feeling as though the previous attempt was a failure. 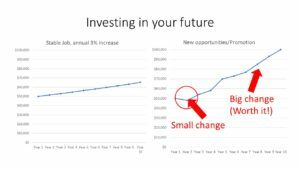 How much time/money are you willing to invest in your future? Do you consider the time/money spent an investment or a sacrifice? If your answer was “sacrifice”, it could indicate a lack of motivation to turn your dreams into reality. If you don’t think the investment is worth it, you’re likely to find excuses not to spend your time in pursuit of your goal. You will need to set aside time for training, networking, researching, and other job search activities. Managing your time wisely can help you get more done in less time than if you tried to “wing it”. You can either MAKE your time work FOR you, or LET it work AGAINST you. Prioritize: You might not be getting the most out of your time. If you find it difficult to eliminate activities that waste your time, commit to abstaining from these time-wasting activities at least until you’ve reached your goal. This could be a chance to make an adjustment you needed to make in your life. Get help: If you’re not in the habit of asking for help, this is a great time to learn! People who try to do everything for themselves (as well as for others) and don’t ask for help experience undue stress. The stress can cause burnout before you can reach your career goal. Training and other job search activities are not always free, but are often necessary. Get help: If training costs seem prohibitive, ask what assistance can be available. Check with your local work assistance office (usually known as the “Unemployment Office”) to find out if aid programs are available. You don’t necessarily have to be unemployed to qualify for assistance. It never hurts to ask—and the worst they can say is “no”. Prioritize: On-the-job training or tuition assistance could be available from the new employer (usually listed on their website). It never hurts to ASK! The Human Resources department is the best place to start when asking about resources. For a smaller business, members of management should be aware of additional training programs. Do you need it NOW? Other opportunities in the industry/organization might not require the credentials—or the higher level of credentials won’t be necessary until you have additional experience. Gaining relevant experience could also give you a new perspective on training you wouldn’t have had before. On-the-job training, and other hands-on experience in the context of the work that is done can also make the most important and relevant aspects of your training more memorable. This is also more valuable to an employer. If you’re in a comfortable position but still desire a change, the best way to increase and maintain motivation is to focus on how you’ll FEEL in your new career. Hopefully, asking yourself these questions has helped to reveal any of your “trouble spots” as you prepare for a job search. You will get better and faster results when you first clarify your purpose, prepare, and increase your motivation. How much do you plan to (need to) make? What are your skills/experience worth? What is your “deal-breaker” amount? Are you motivated enough to finish what you are starting? For a successful career transition or job search, contact CrossRoads at 317-842-8881 today. Next post: What is counseling?